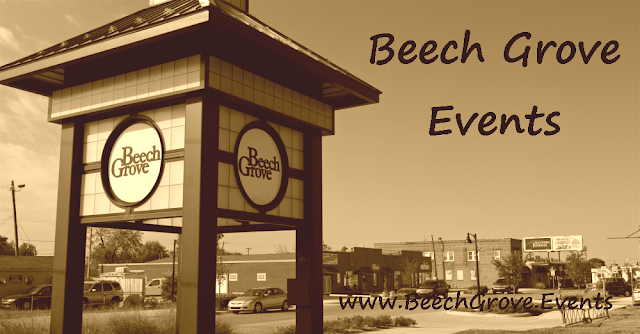 Beech Grove, IN (November 1, 2017) - Anyone with an interest in history will not want to miss the 26th annual Book, Postcard, Political and Paper Show Sunday at Beech Grove High School, where more than 40 vendors from eight states will sell their wares. While the postcards normally command the most attention, the event will also showcase rare books, political buttons of all sorts, movie posters, old magazines and newspapers and other attention-grabbing items, including an 1864 U.S. presidential ballot that featured Abe Lincoln and an 1860 Confederate presidential ballot with Jefferson Davis as the candidate. 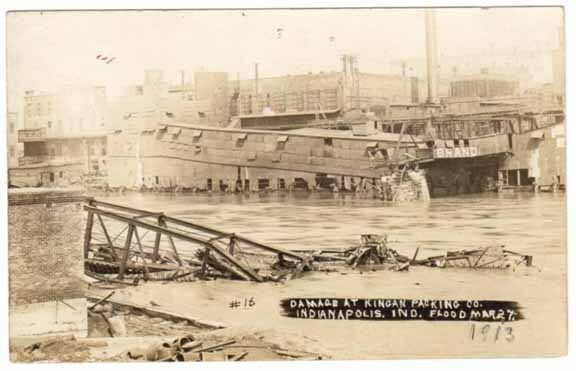 Flooding damaged the Kingan Packing Company at Maryland and Blackford streets (present day site of Victory Field and the Lawn at White River State Park). The ruined Vandalia Railroad bridge is pictured in the foreground. There will also be a book binding demonstration. It’s estimated that over 200,000 postcards will be on display. They will be priced from 50 cents to $700, but most will cost between $2 and $40. 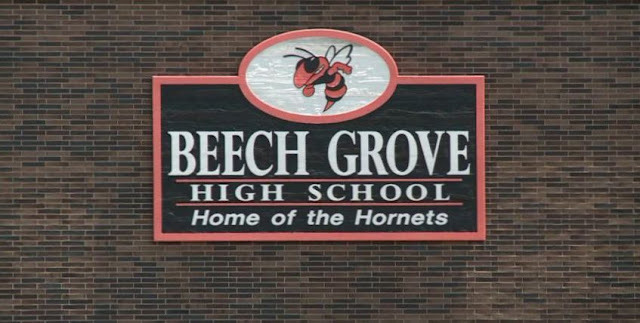 Harvey Warrner, a retired Beech Grove High School principal who is helping to organize the show, said some people will be there all day looking at the cards, which are itemized by topics like states, animals, rivers, parks, caves, holidays, etc. Postcards were first printed in the 19th century, but it took some time for them to gain in popularity because many people didn’t care for the idea of writing notes that anyone could read. The value of old cards is dependent on their condition, rarity, age and subject matter. The oldest known postcard was sold for nearly $50,000 in 2002 at the London Stamp Exchange auction. Posted in 1840, the card’s value lay in its age, as well as the fact that it was among the earliest cards printed and mailed. Pioneer postcards, which were printed before July 1, 1898, are also valuable. They were used as advertising pieces and often carried information about a shop or a sale. Warrner said he knows people who are looking to complete their collections of all of Indiana’s courthouses and high school gyms. “The cards are out there. You just have to track them down. Some of the rarest items that Warrner has seen at the show are Albert Einstein’s autograph (valued at $8,000) and a first edition book by Mark Twain. 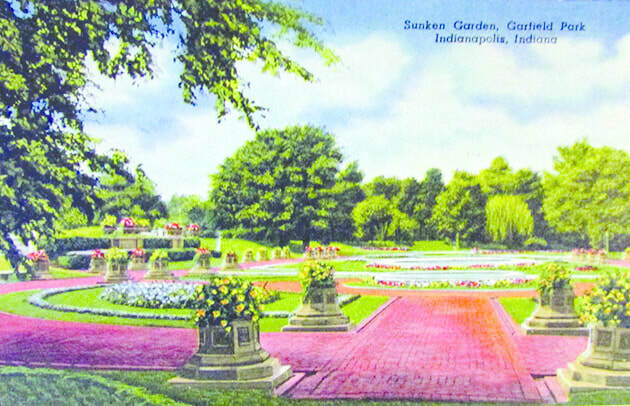 The Sunken Gardens at Garfield Park are depicted in a 1955 postcard. Also coordinating the show is Assistant Principal Rande Clevenger. “We’ll start setting up Friday, and I have arranged for some seniors to help the vendors unload their merchandise,” he said. The show, the biggest of its kind in the state, according to Warrner, runs from 9 a.m.-4 p.m. at the school, 5330 Hornet Ave., off the 3900 block of South Emerson Avenue. Booth space costs $55 and is available by calling 317-786-1447. Admission is $3. Proceeds will benefit the school’s Renaissance Program, which rewards students for academic excellence, outstanding attendance and being good leaders. For people who get hungry during the show, lunch and desserts will be served. “Harvey and his family will prepare a great luncheon,” Clevenger said.